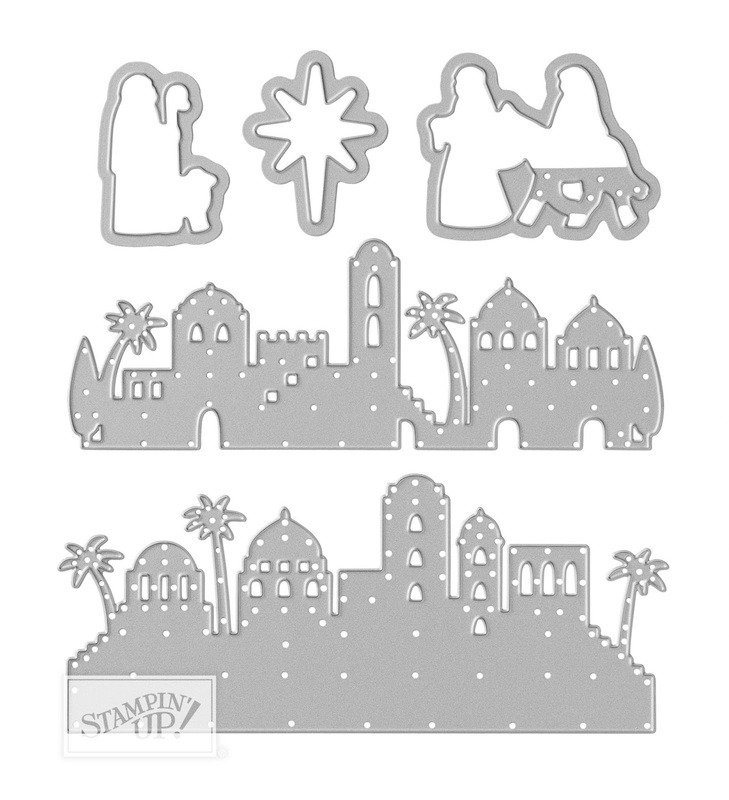 Night In Bethlehem is a lovely Christmas stamp set available in the new Stampin' Up!® Holiday Catalogue. 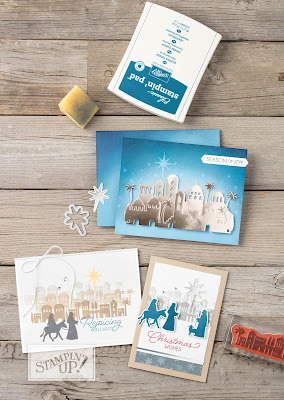 It offers a variety of ways that it can be used, from easy stamp to card all the way to embossing and layering. These are some samples you'll find in the catalogue on page 26. Take a look at all the beautiful Christmas, Halloween and Autumn themed stamp sets, bundles and accessories. Stampin' Up! is well known for the offering of coordinated products and you'll find some beautiful suits in this catalogue. 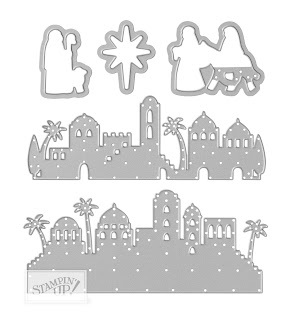 The Stamp set comes with a set of Edgelits in a bundle and if you purchase them together you'll save 10% on the price. The Edgelits make cutting out the images so quick and easy and they add a wonderful dimension to your cards. 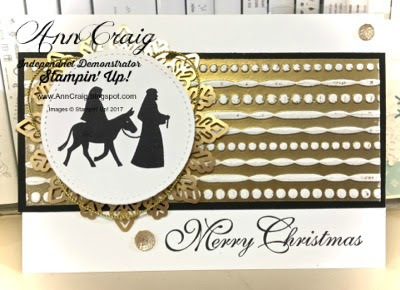 I chose to do 4 different samples in my class this week - today I'll show you one that involves both heat and dry embossing and the use of some of the accessories that are available. The card base is Thick Whisper White. The image stamping is done with Archival Basic Black ink onto Whisper White card. This is then cut out with the 2nd largest circle from the Stitched Shapes Framelits and matted onto a Gold Doily. A little gold thread was scrunched up behind the image that has been raised on Dimensionals. To achieve the gold and white patterned texture, I patted Versa Mark ink directly onto the Embossing Folder, inserted some Whisper White and ran it through the Big Shot. I then sprinkled it with Gold Embossing Powder and heat set it with the heat tool. I didn't have space for any of the greetings from this set so I found my favourite script and stamped "Merry Christmas" below. A couple of Gold Faceted Gems complete the card. This was a fun card to make and it did not take a lot of time for the rich result. You'll find a list of the products used at the end of the post. You are most welcome to shop online by selecting any of the products - they will take you directly to my on-line store. Check back tomorrow to see more examples made with this versatile set.